Blackhawk’s No-Latch Ambidextrous Charging Handle is a drop-in peerformance upgrade for any AR-15 that gives the shooter full ambidextrous control for fast charging of the rifle or malfunction clearance. Using a leaf spring built into the handle itself, the innovative Blackhawk No-Latch Ambidextrous Charging Handle eliminates the need to squeeze that small latch found on the standard handle. Operate the handle from any position - left, right, standing, prone Oversized, overmolded polymer lever with aggressive grip texture Sturdy machined 7075 aluminum frame for long-term reliability The Blackhawk No-Latch Ambidextrous Charging Handle’s oversized polymer lever enhances weapon control, yet easily clears low-set optics. Machined aluminum charging handle drops in to standard AR-15 and AR Style .308 receivers to give positive operation for right and left handed shooters. Built with thicker dimensions than standard charging handles to withstand wear and rough use. Large diameter coiled spring pin absorbs shock and flexes so it won’t fail under extreme conditions. Broad contact points make traditional and tactical weapon manipulation easy, and grooved surfaces help weapon retention and assist positive charging operation while wearing gloves. 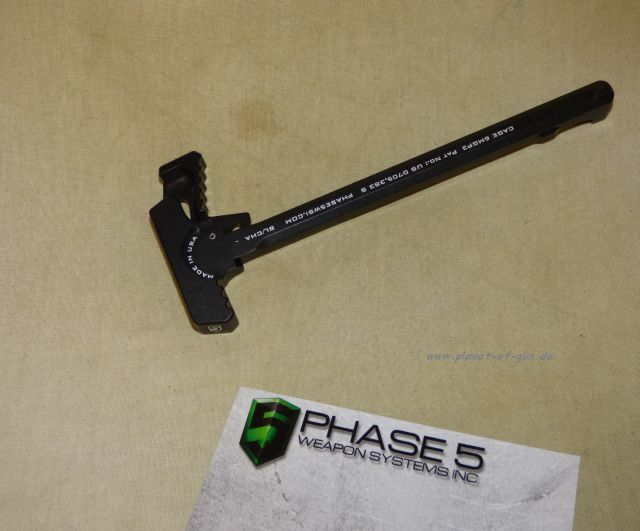 Battle Latch Charging Handle Assembly fits AR-15s and is designed for right handed shooters. SPECS: 6061-T6 aluminum, Mil-Spec Type III hardcoat anodized, matte black finish. Tactical Latch ARC-L von TECHWAR --- sehr hochwertig! TacLatch ARC charging handles from Techwear are ambidextrous charging handles that help you charge the rifle quickly and efficiently, without false tries, during competition, law enforcement operations, or just during a casual day at the range! The TacLatch ARC charging handle mechanism is designed to release the catch when pressure is applied to ANY part of the levers, enabling the shooter to operate the gun faster than with a traditional, mil-spec handle. The TacLatch ARC also makes it easier for smaller-statured individuals to operate the charging handle with ease. And the ARC handles are operated entirely by a standard spring - no complex cams or intricate mechanisms that can fail or jam at the wrong moment. The force of operating the handle is spread across the entire handle, thus minimizing the risk of excessive wear on certain components. Made of strong, lightweight 7075 aluminum alloy Durable hardcoat anodized finish Stem of handle has a touch baked-on dry-lube coating in smooth operation Two models to choose from The TacLatch ARC-L model features extended, ambidextrous levers that maximize speed and smoothness of operation during competition, with plenty of clearance for AR-15s fitted with a full-size scope. The ARC-L activates when any part of the lever is pressed, ensuring reliable operation in all environments. The ARC-S handle has rounded, ambidextrous latch levers that will not snag gear or poke you while you’re carrying the rifle on a sling. The ARC-S latch mechanism is specifically optimized for shooters wear gloves and for those with small hands. 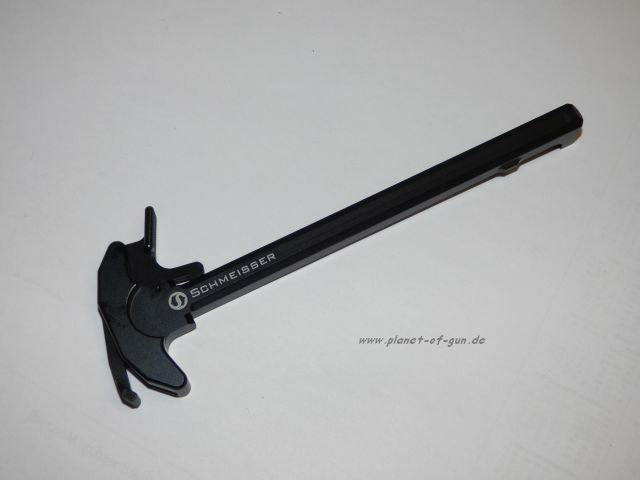 A Techwear TacLatch ARC Charging Handle is a fantastic upgrade for your existing AR-15 or a great option for a new build! passt überall wenn kein Piston System verbaut ist! 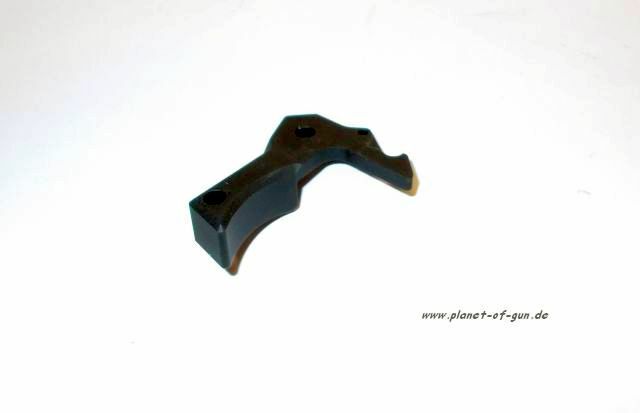 Drop-in replacement for factory issue handle lets you charge the rifle from either side of the receiver with a rapid palm “blading” motion or the traditional finger/thumb hold. Dual, over-sized release levers are mirror images of each other, with deeply grooved surfaces that ensure positive contact so you can operate the handle in one fluid, fast motion with wet or gloved hands. Radiused edges won’t cut the hand or snag on clothing and gear. Gives top of rifle a unique, aggressive appearance, too. SPECS: Machined 7075 T6 aluminum, hardcoat anodized, matte black. 4 oz. wt. AR-15 fits AR-15/M16 rifles with mil-spec upper receiver. May not fit some SIG 516 model rifles. 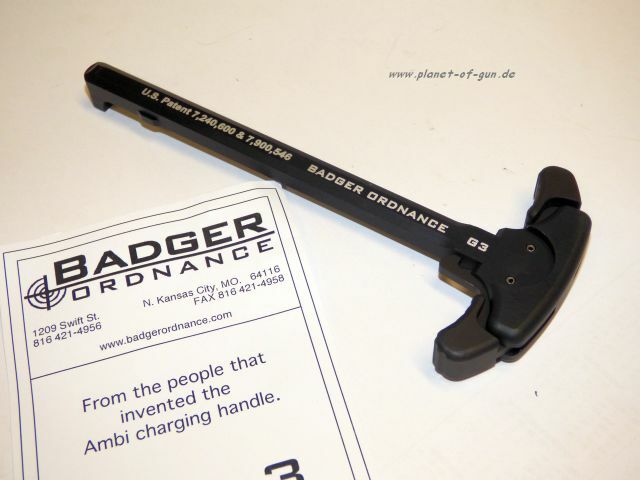 The 5.56 Gen 3 Ambidextrous Charging Handles from Badger Ordnance have an oversized design to provide easier manipulations. 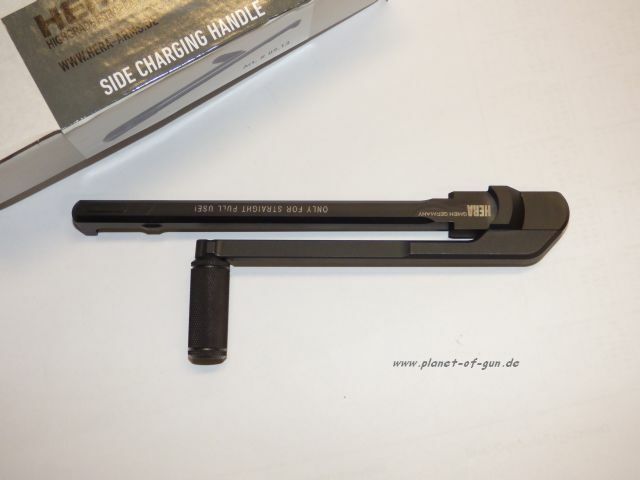 These charging handles allow for use of either the finger and thumb grip or the palm of the hand to be used to charge the rifle on both the strong and support side. 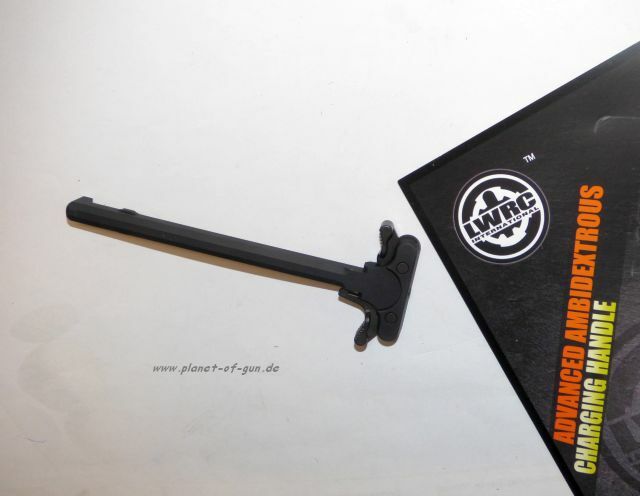 Manufactured to LWRCI’s exact standards, this charging handle features large bearing surfaces on the rack and pinion latches providing absolute user interface. Provides true ambidextrous usage. The charging hand is type II hard coat anodized, and salt bath nitride for complete corrosion resistance. It is a drop-in replacement for standard AR-15/M4 platform rifles. 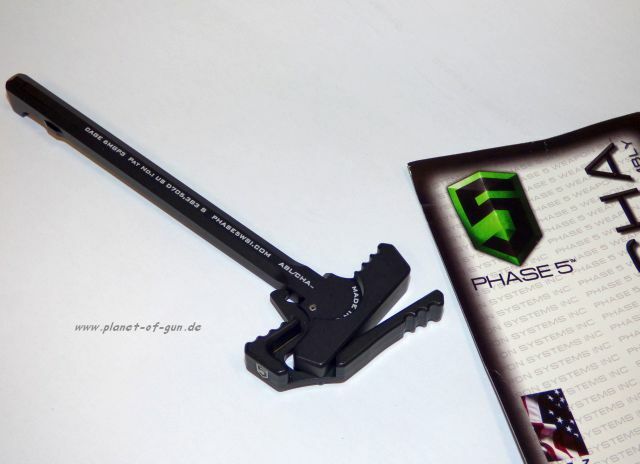 Heavy-duty charging handle has an innovative, oversized latch that distributes pull force evenly across the entire handle for fast, smooth, reliable operation with the support hand. Prevents the critical roll pin from breaking and rendering the latch inoperable. Machined from billet aluminum with extra metal reinforcing the stress points to stand up to hard operational use. 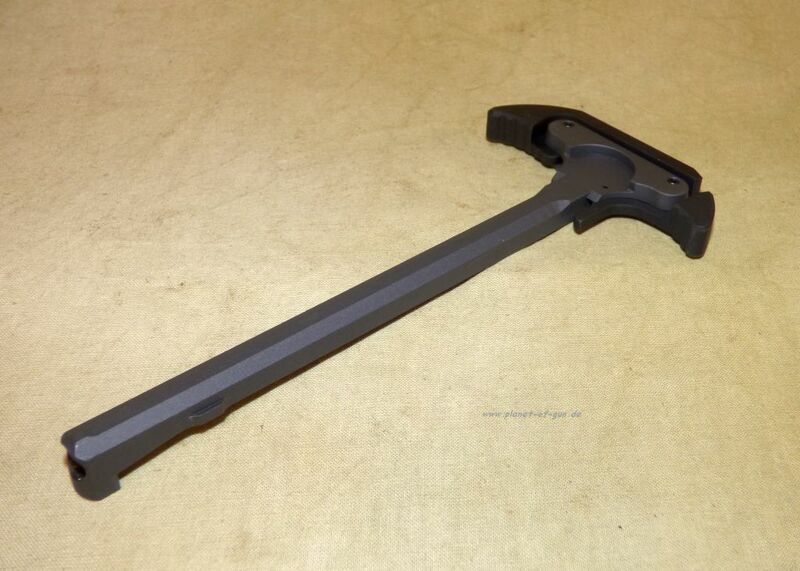 Ambidextrous Charging Handle features a latch on both the left and right hand sides. 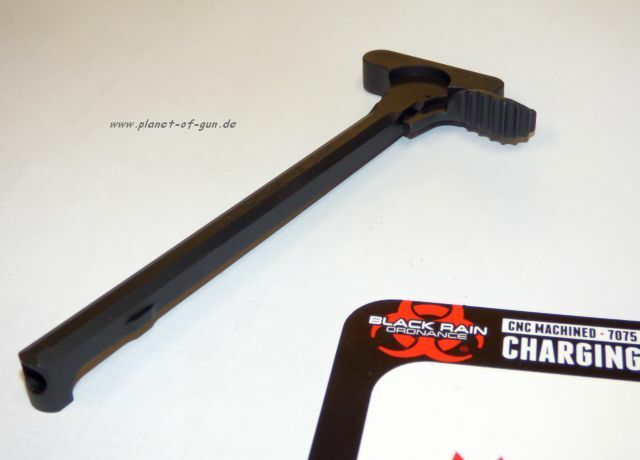 Heavy-duty charging handle has an innovative, oversized latch that distributes pull force evenly across the entire handle for fast, smooth, reliable operation with the support hand. Prevents the critical roll pin from breaking and rendering the latch inoperable. Machined from billet aluminum with extra metal reinforcing the stress points to stand up to hard operational use. Available with Medium length extended latch or Large latch that’s ¼" longer for an even bigger, “can’t miss” grasping surface. Small latch duplicates the size of the issue latch but includes the same design upgrades as the Medium and Large latches for increased strength and dependability. Rugged aluminum charging handle features an oversized latch with aggressive serrations to provide an ultra- secure gripping surface when charging the weapon or clearing malfunctions. High-profile Tac Latch is machined from 7075 T6 aluminum to exact tolerances and with Mil S-8625 Type III Class 2 hardcoat anodized with a Teflon surface coating for superior performance and trouble-free operation. 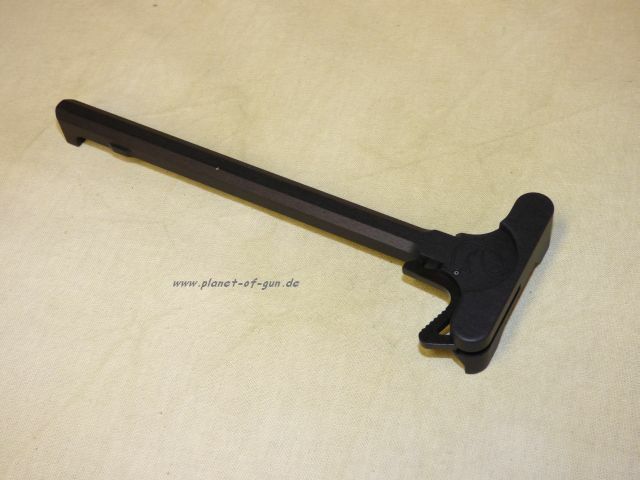 Tac Latch is available separately for fitting to standard charging handles to improve handling. SPECS: 7075 T6 aluminum, Type III hardcoat anodized, Teflon coated, matte black. Latch pad approximately 1” (2.5cm) wide, ½” (1.3cm) high.